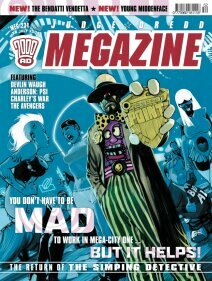 The Judge Dredd Megazine Odyssey: Meg 234 - And Your Point Is? Meg 234 - And Your Point Is? What a great Frazer Irving cover staring Jack Point! All sorts of weird Mega City One characters in the background and Jack in his classic pose. Get the Point? Brilliant stuff! Let's dive straight into the last episode of the Dredd and PJ Maybe story Monsterus Mashinashuns. It didn't disappoint and what a great set up for later events! Dredd returns to MC1 and starts thinking things through. Could Don Pedro Montez really be Phillip Janet Maybe? Did he fake that cut finger... I'll say no more. Suffice to say there is a chase and a stand off between Maybe and Dredd. If, like me, you know the story from here, the ending won't be a surprise, but otherwise... ;-) Top marks Wagner and Ezquerra. Part 4 of the Devlin Waugh adventure All Hell sees our trio of heroes still in pursuit of the trio of evil guys. The enemies lay a number of traps, but are Devlin and the team are equal to them? The mystery deepens as to what exactly they are up to. Yeah, still enjoying this one. Lots going on and as we descend deeper into Hell, there are more nasty things to fight. Good job by Smith and MacNeil and looking forward to the next episode. Also returning was The Bendatti Vendetta, with Robbie Morrison and John Smith on scripting and painting duties as before. Set in Naples, the team are tracking a mafia organisation and targeting the head of the operation. Why? We don't know. We may never find out, I don't know, but it's good, solid spies and baddies stuff here. Not very Sci-fi. Not Dredd. But I like it. Others, I fear, will not. Onto the text articles and Robbie Morrison was being grilled in the Interrogation slot. It was interesting to hear Robbie recount his childhood and how he nearly didn't make it into comics. Part 2 is in the next issue, which I think might focus a lot on Nikolai Dante. The Avengers were the British Icons and this was a great article charting their history. I'm a big fan of this show so it was good to get some insight into how it got started and evolved over time. And I still secretly fancy Emma Peel to this day... The Dredd Files lumbered on... Over in Heatseekers, Si Spurrier watches the Movie Conan The Barbarian on DVD and delights in the experience. The Outer Limits was explored in the Cult TV column. Meg 237 - 15 Years Creep! Meg 235 - Tooled Up!